Teenagers at the Arkham Home For Wayward Girls live surprisingly normal lives, given the magnitude of the crimes they have committed. There are supervised outings for mini-golf (on a closed course); they have ice cream sundaes on Thursdays. They talk on the phone to young men from the Arkham Boy's Home (although no visits; most of the boys are serving adult sentences). Their smocks, though not fashionable, are not institutional; the girls are allowed to pick their own fabrics and sew the smocks themselves, in Home Ec. "Trustys" (those without violent or suicidal impulses) are even allowed belts! And thanks to the generosity of the Tangee corporation, all the girls have ample supplies of lipstick and face powder. Yay! Tangee! They still make Tangee lipstick and blush, you know. I get mine from the Vermont Country Store. I just ordered this! 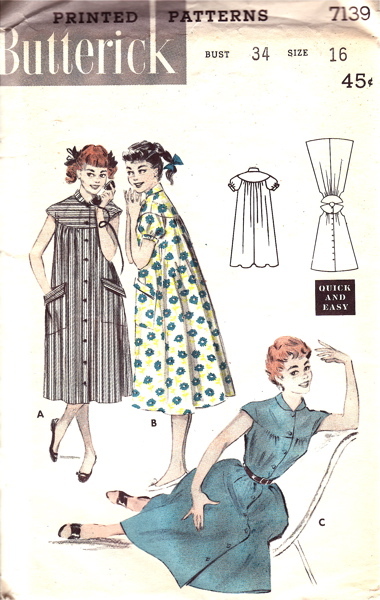 Id been looking through the pattern books for a summer housecoat but couldnt find one I liked. My mother used to wear this type in the summer and they were great. She used to stuff those pockets! Apropos of nothing on the blog, you probably already know about this article about the Websters third but since I found it over at Michael Leddys blog and found it interesting, I thought Id send it along anyway. Belted, I actually kind of like it. The rounded yoke is really cute! I may not know much about marriage, but I hope these mythical housecoats were kept behind a secret panel in the closet…far, far from hubbys eyes. Theyre obviously really comfortable to wear and do housework in, but they also look like something beauty shop attendants would wear. Basically, theyre mumus with buttons. God help me….NOW I WANT ONE! Looks like the house dresses my grandmother wore, made from flour sacks. It could be cute, made out of a sheer fabric like organza and worn with marabou trimmed mules. My grandma used to call those dusters. It could be a Kentucky thing. Hers always featured gripper snaps down the front. My mother calls them dusters, too, and shes originally from New Jersey. I tend to think of dusters as the long cowboy coats, but maybe thats because most women my age dont wear housecoats any more.Thats an adorable pattern, and it looks awfully appealing for summer wear. White eyelet would help a lot. They are nice house coats. Love those big pockets; you can put lots of things in them when doing stuff around the house.